Good taste is always in vogue by traditional culture and your taste buds. Products from the Ole North State satisfy both standards. 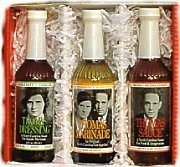 We received an email from a customer and quote "this is the best ---- stuff that has ever been put in a bottle" referring to Thomas Marinade Sauce. That is quite a compliment. For Food & Imagination. Gift Box from Thomas Gourmet Foods. Choose the all purpose or barbecue sauce. Children love Lip Lickin Sauce. Thinking of warmer climates during the Carolina winter or the Minnesota winter for that matter. You should try a taste of the Caribbean from Down Island Dexters. You can choose between 6 different sauces and get a 6 oz container of their dry jerk seasoning for that taste of the Caribbean. The right balance of red pepper and sage from Ward's Fresh Country Sausage will satisfy your palate while taking the chill out of the winter air. KC Diamond Beef Jerky delivers a tasty treat for the hiker, hunter, fisherman as well anyone that likes beef jerky. The company is young but the recipe is tried and true. The beef jerky from KC Diamond is vacuum sealed and easy to pack in your backpack, duffel bag or luggage but you will probably want it easily accessible for that tasty snack. Enjoy the fruits of summer with your holiday meals with Raggio O'Chutney. Chutney is a savory sauce made of fruit, sugar, vinegar, ginger, raisins, and a mixture of spices. 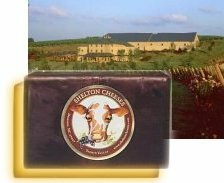 Shelton Cheeses is located at Shelton Vineyards, Dobson, NC, where we handcraft a variety of cheeses on the estate. We are dedicated to crafting unique, artisan cheeses using traditional methods. Each cheese is created from high quality milk provided by a family dairy. The local dairy is raising Jersey cows and selected goat breeds on pasture exclusively for Shelton Cheeses. Jersey cows offer high quality milk, containing more butterfat, protein, and vitamins, which make extraordinary cheese. Goat milk cheese, is as well, a culinary marvel, due to its intense rich and tangy flavors, while still remaining low in calories and fat. 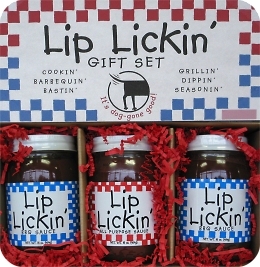 There is still time to ship your family, friends and business associates "Gifts of Good Taste". Good Taste never goes out of season. Web site ©2000. CarolinaHarvest.com is a trademark of Virtual Marketing Systems, Inc.